Private, Unlisted, and Scheduled videos on YouTube all serve a different, but important purpose. Knowing why and when to leverage these videos types can benefit you and your business. As a quick starting point, PUBLIC is the default setting for all YouTube videos. Anyone can search for, view, or share a public video. Now, here's where things start to get interesting. One of the first privacy options YouTube offers is that of PRIVATE videos. These videos can only be viewed by those who are invited to view them by the uploader. The uploader can choose up to 50 people to share the video with. However, those invited must have an active Google Account (and must be logged in) to view the video. If an invitee has multiple Google Accounts, they will have to be signed into the account the uploader has shared it with to see the video. 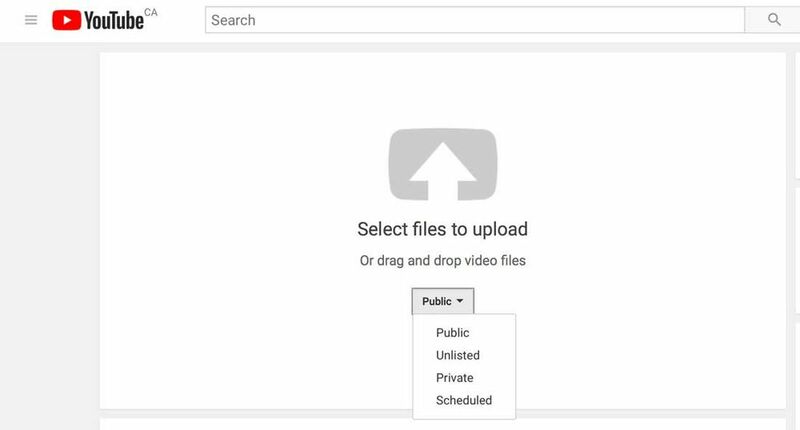 Private videos will not appear in any search results, video recommendations, or the uploader’s video tab section, and subscribers to a channel won’t receive a notification when a private video is uploaded. If one of the uploader’s invitees tries to share the video with their friends, it won’t matter - only the invitee will be able to see the video. So why would you choose to use the private video setting? There are so many great ways of benefitting from this setting on YouTube. If you live far from your loved ones, sharing videos is a powerful way to stay connected. Your child’s first step, a weekly check-in, or footage from a family holiday - you want to share these milestones, but not with the whole world. Private videos are a great way to ensure the right people are the only ones who can view these treasured moments. Many larger organizations use video as an effective training tool, to share new company policies, or even to provide updates or congratulations. Using the private video setting ensures internal messages and content stay internal. It also means a company can create an entire internal library of videos to help employees as they grow or switch roles in the organization. Video resumes have grown in popularity over the past few years, as more and more job candidates are looking to stand out from the crowd. Private videos allow the user to upload their video resume to YouTube and share it with potential employers only. Using YouTube to share these video resumes means that your potential employer won’t have to download large video files, they can simply click a link in your online C.V. and of course there’s no hassle with file formats. As a videographer, an online portfolio is key to gaining new clients. But maybe your previous clients haven’t signed off on public sharing of their videos, or some of the videos have featured sensitive topics. By uploading the portfolio to YouTube as a private video, videographers can then share with potential clients, while preventing unwanted comments from appearing and avoiding any confidentiality issues. YouTube’s UNLISTED video option gives users something between the Public and Private settings. Unlisted videos can be seen and shared by anyone with the video link, including those who do not have a Google Account. This means that while unlisted videos will not come up in search results, a user’s video tab, a subscriber’s feed, or in suggestions, the video can still be seen by anyone who comes across the link. There are, in fact, entire sites dedicated to listing unlisted YouTube videos. Another note: YouTube treats unlisted videos like public videos in many ways —the video can be flagged for inappropriate content, and uploaders need to avoid using copyrighted audio or video. Many people remain confused about the benefits of unlisted videos, so we’re here to point some of them out. Do you run a site or a blog? Do you, perhaps, embed videos in your website on occasion? Maybe you want to keep the content exclusive to that platform. In this case, unlisted videos are a great option. You’re still able to upload and host the videos on YouTube and then embed them onto your site, but they won’t be visible on your YouTube page. You’re trying to clean up the content you’ve posted to YouTube over the years - we get it! Many users began posting to the platform in their early teens and continue using it well into adulthood. If you want to ensure that anyone who has embedded or shared one of your videos retains access, but want to remove its visibility on your channel, changing it to an unlisted setting is the best course of action. Unlisted videos are a great way of collecting a small sampling of reactions, or ensuring that a video already has positive comments, before making it available to the broader public. They’re perfect for gaging reactions to tutorial videos, or even sharing music videos with fans first. If you work in social media or marketing, you know that scheduling content is of immense strategic importance! When you publish information has a huge impact on who sees your content - certain times of day and days of the week are definitely more ideal than others. You’re probably already scheduling tweets and Facebook posts, but did you know you can also schedule video publishing on YouTube? If you’re not already doing so, you need to. Scheduling can be done through YouTube itself, or through a social media distribution platform like Hootsuite. As more and more people switch to mobile browsing, video is increasingly the most engaging content on the web... But few platforms can offer what YouTube does - an audience made up of more than a fifth of the world population! YouTube offers many great ways of sharing your videos, so whether you’re scheduling them as public, listing them as private, or ensuring they’re unlisted - it’s time to get posting!